ORLANDO – The 45 year wait for a state title was well worth it for Bishop Moore who held off Wakulla 37-34 in the Class 5A state title game at the Citrus Bowl. After 47 minutes of back and forth trading punches, finally someone couldn’t deliver the knockout blow. Bishop Moore coaches and players held hands and anxiously awaited as five star athlete Felipe Franks lined up for a potential 50-yard game tying field goal with seconds left in the game. Franks kick had the distance but sailed wide left setting off a huge celebration on the Bishop Moore sideline. 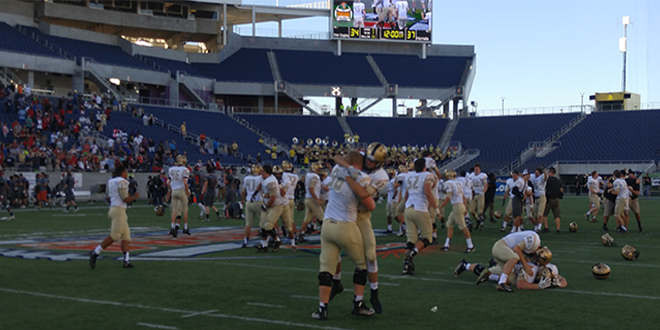 The kick was needed as Bishop Moore rallied from behind on its last possession of the game. Trailing 34-30 with 5 minutes left in the game, Bishop Moore (14-1) took over facing their last potential drive of the season. Collin Hartmann (13 of 16 for 128 yards and 2 touchdowns) led the Hornets methodically down the field nickeling and diming the War Eagles defense. Hartmann 10 yard run on second and nine put the Hornets down to the 18-yard line. Trey Page followed with a 18-yard run down the Hornets sideline giving the Hornets a 34-30 lead with 1:10 left in the game. Both teams traded scores back and forth early on like a chess match or a prize title fight as both looked for the knockout blow. Hartmann led the Hornets on an 11 play opening possession drive resulting in a Hartmann 31-yard touchdown pass to Rayshad Lewis five minutes into the game. Wakulla (13-2) didn’t waste any time answering a minute later as Franks found Keith Gavin for a 37-yard score tying the game at 7-7 with 6:11 left in the first quarter. Following a Bishop Moore fumble forced by Antonio Morris and recovered by Herbert Franklin, Franks connected with Gavin again for a 11-yard strike giving Wakulla a 14-7 lead with 3:57 left in the first quarter. Franks punt was blocked by Zander Zimmer which set up Trilion Coles, son of former NFL great Laveranues Coles, 1-yard touchdown run which tied the game at 14-14 midway through the second quarter. Wakulla took the biggest lead of the game at 27-19 after Jake McCarl picked up a Hartmann fumble and returned it 44 yards for a score with 1:52 left in the third quarter. Again Bishop Moore answered as Hartmann connected with Lewis for a 25-yard score and Lewis converted the two point conversion to tie the game. Jake McIntyre 48-yard field goal gave the Hornets a 30-27 lead with five minutes left in the game their first lead since being up 7-0 early in the game. Again Wakulla had another answer as Franks (12 of 18 for 179 yards and two touchdowns) directed the War Eagles on a 9 play 80-yard drive capping it on a Brandon Berry 21-yard touchdown run with 4:55 left in the game. Trailing 27-19, Hartmann faced third and 9 from the 25 yard line and the biggest deficit of the game with the season on the line. Hartmann found Rayshad Lewis, son of NFL Hall of Famer and former Miami Hurricane Ray Lewis, in the back of the end zone for a 25-yard touchdown pass. Lewis ran in the two point conversion tying the game at 27-27 seconds into the fourth quarter.